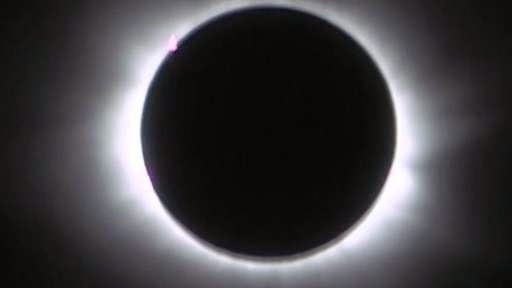 ...in a nutshell, solar eclipses are dangerous because the sun can come out from behind the moon and "surprise you" before you have a chance to look away. And this is actually even worse than when you normally look away from the sun because during the total eclipse, it is dark out, and your pupil therefore dilates so that it can let in enough light to get a good picture. Then, when the sun reappears and starts flooding the area with really bright light, not only are you staring straight at it, but your eye is in a state where it is wide open, and actively trying to let in as much light as possible. Our Lady leads us to and shows us her Son. She is the cause of our joy, a singular vessel of devotion. What to the physical eye during an eclipse is dangerous is to the soul, life and intense light, light so bright it illuminates all those who 'sit in darkness'. Mary, whose light is not her own, comes between us and her Divine Son, not to block out her Son, but to magnify Him. Because unlike her Son, Mary is not God, we could gaze upon her during this heavenly eclipse and our spiritual eyes dilate to get a good picture. In this imagery, we cannot simply look at her Son as He is in his glory because 'nobody can see God and live'. She prepares us to behold her Son in Heaven when we have been purified from every sin and imperfection. She, alone, unique of all creatures, the sinless Queen, in her triumphant humility, could look upon the Sun of Justice and never look away, never be blinded, never be hurt, never be reproached. She stands like the moon today between us and Jesus Christ, not blocking out His glory, but so that looking upon her we may adjust our spiritual eyes to gaze upon this kindly Mother who prepares us so that when she reveals her Son, He reappears and starts flooding our soul with 'really bright light', so that not only will we be staring straight at it, but our spiritual eyes will be in a state where they are wide open and actively trying to let in as much light as possible. The only question is...does that analogy make much sense? I'd really like it to. Perhaps it needs adjusting. Can anyone help it make sense? I'm not sure it does! By the way, upon the Feast of St Joseph, I obtained a job as an English language teacher. Therefore, a belated public thank you to St Joseph! BBC say they are going to get 'further analysis' of the spot at 10 o'clock. Is that a flare, or something else? I warned you what would happen if you stared at the sun. Great piece. 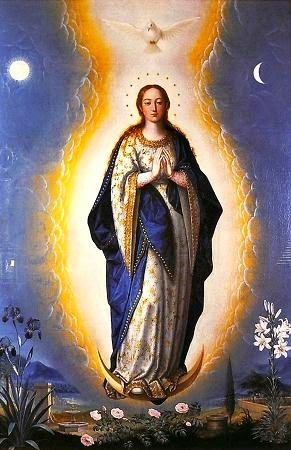 I never saw that picture before - it's very unusual for Our Lady to be represented without head covering. Congratulations on the job - I think you'd make a great teacher. God bless. Many congratulations . You will make a great teacher, I have learnt so much from reading your blog too...!! It makes sense, Bones. She is pure and unadulterated, therefore for Her to look upon love unadulterated is not pain to Her for She has no stain of treachery in Her. When I was a kid we were told that if you looked at an eclipse you'd go blind or partially blind. We all looked anyway (maybe the prospect of blindness was as exciting as the vision of the time crossing over time). Probably some of us did go partially blind. Apparently the moon transforms the light coming from the sun so that what we see at night is not merely reflected sunlight but light, yes with the sun as its source, but different in substance from sunlight. 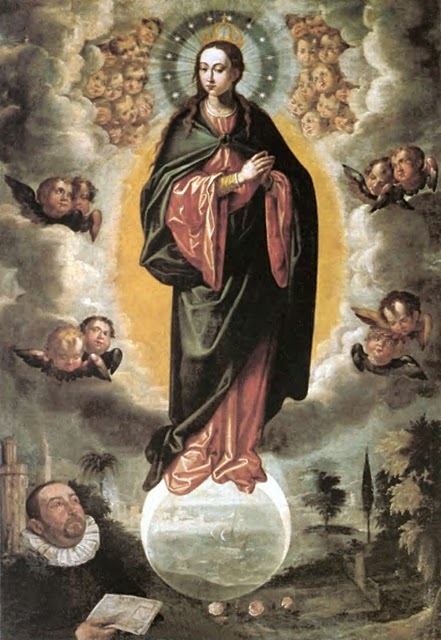 In some instances the imagery of the moon beneath Her feet - months; clothed in the sun, the years; and crowned with the stars - the fixed heavenly lights beyond the vicissitudes of the 'fates', shows Our Lady's perpetual rule of Grace over all seasons. The light She gives forth is unearthly, however - not something natural or time bound but most certainly supernatural. While the Church might be in 'eclipse' we need only a little faith to understand that temporal shadowplays are just that, and nothing temporal can overcome supernatural Grace. PS. All the best for the new job. The blessing of St Joseph and the intercession of Our Lady be with you. PPS. St Francis de Sales. Most general Patron of Teachers. Congratulations on the new job Bones. Good luck with it. I'm sure you'll be a great teacher. Slightly off topic, but does anyone know why the warning second coming (Maria divine mercy)website has been closed down? Echoing congratulations to you Laurence. Isn't it nice when good writers actually get jobs teaching writing! Dear Bones, Congratulations. I'm sure you will do well. Sometimes St. Joseph tends to be eclipsed but he's a great advocate. Good post, and best wishes in the new job. This is a very thoughtful piece which shows something of your love for Our Lady. May God bless you and St. Joseph guide you in your new job. Yesterday saw another splendid 'Day with Mary' - not a seat left in Westminster Cathedral for an all-day celebration of Our Blessed Mother. Excellent sermon from Father Martin Edwards, Mass, Rosaries, Stations of the Cross and Benediction all with lots of Latin. Franciscans of the Immaculate providing great support and leading the singing. The sheer devotion and acknowledgment of the real presence of Christ Jesus was particularly striking. I find it odd that these weekly events in different venues are mainly attended by ethnic minorities and others from abroad. Where are the English Catholics and what do the hierarchy make of all this? Incidentally the FFI sold me a copy of "Remaining in the Truth of Christ" for a mere £10 - elsewhere selling for £18.99. Go to the site--The Biblical False Prophet Has Arrived and there is a speculative article about why MDM's site is down. I also have heard she's going under a different site name--filamena or something. I am mixed about her. I am not sure about moons. It is the symbol of a religion, you cann guess which one, as well as being associated with the Hindu god Shiva. I am not "mixed" at all about so called "MDM". Everything about it smells false, unbalanced and possibly worse. Its anonymous source peddles a mish mash of ideas from Protestant Pentecostalism and various schismatic lunatic fringe conspiracy theories. Among other daft things they (we know not who) claim that St. Peter is soon going to rule as Pope in person on earth again for a thousand years. Stay calm, stick to the Catechism and steer clear! Best wishes with teaching "job". I pray that you may persevere. Might to good to remember that St. Joseph "was a Muggins for God" to quote the late Father Des Coffey.